StrandVision Digital Signage recently announced additional electronic sign background templates along with enhancements to the StrandVision service that allows subscribers to submit their own personalized backgrounds to create a consistent business marketing look across their digital signage network. 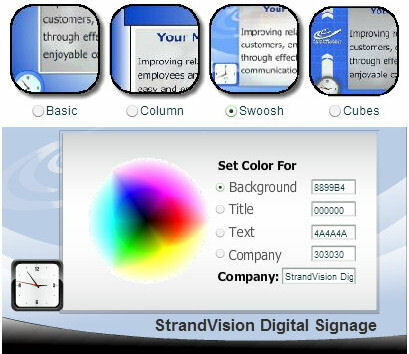 To hear more about StrandVision’s digital signage software solutions for your organization, visit www.StrandVision.com or call 715-235-7446 (SIGN). Providing in-store music can give digital signage suppliers a foot in the door with retailers that positions them well to later provide a screen network, according to a German agency. Speaking at the recent International Scala Conference in Amsterdam, Muse Content’s CEO Marco Burkhardtsmayer said that adding music to a digital signage firm’s offer not only provides a new revenue stream, but also brings a first contractual relationship with retailers and establishes contact with IT and marketing departments. This entry was posted in Uncategorized and tagged digital signage software, digital software, digital software for signs. Bookmark the permalink.